CHICAGO, November 15, 2018 /3BL Media/ - The International Living Future Institute (ILFI) honored the late scholar and Yale University social ecologist Stephen R. Kellert’s legacy with the second annual Biophilic Design Award last night at a special award ceremony hosted by Interface, Inc., at the 2018 Greenbuild International Conference and Expo. This year the award was presented to two outstanding projects: The VanDusen Botanical Garden Visitor Centre, and the Dixon Water Foundation Betty and Clint Josey Pavilion. The award is in recognition of their achievements that demonstrate Kellert’s understanding that in addition to amplifying the human/nature connection, for a building to be truly biophilic, it must also perform like nature. The building captivated the jury as the epitome of the biophilic design so richly defined by Kellert. The Architecture almost melts into the surrounding landscape. The building is overwhelmingly multi-sensory, from the natural updraft in the central ‘oculus’ to the tactile qualities of the materials, the sparkle of sunshine and gentle diffusion of daylight, to soothing aromas and sounds of nature. The architecture embraces rainwater capture, stores passive solar energies for heating, and induces natural ventilation, just as nature would have done. Delighting the senses with natural patterns and processes that are abundant through the architectural settings, the success of the VanDusen Botanical Garden Visitor Centre is most evident in the Evolved Human Nature Relationships that have been created–the order and complexity, the spaces for prospect and refuge, and the tripling of new visitors to a Canadian national treasure with reverence and spirituality. This building clearly defines the richness of the biophilic design movement. The Jury was unanimously transfixed and agreed that the Josey Pavilion also deserved the highest award. The Josey Pavilion is indicative that biophilic design does not require curved forms, interior plants, or filigree to emulate nature. Like a walk on the prairie, the low slung building is connected to place and climate through its form, materiality, and response to environmental forces. Its Sinker Pine, rusted steel and concrete structure links the senses to the natural world, with no Red List materials. As a flower might open up to the sun, the building opens up to the prairie to bring in natural light and breezes and reducing energy demand, helping to fulfill the Dixon Foundation’s mission to promote healthy watersheds through sustainable land management. 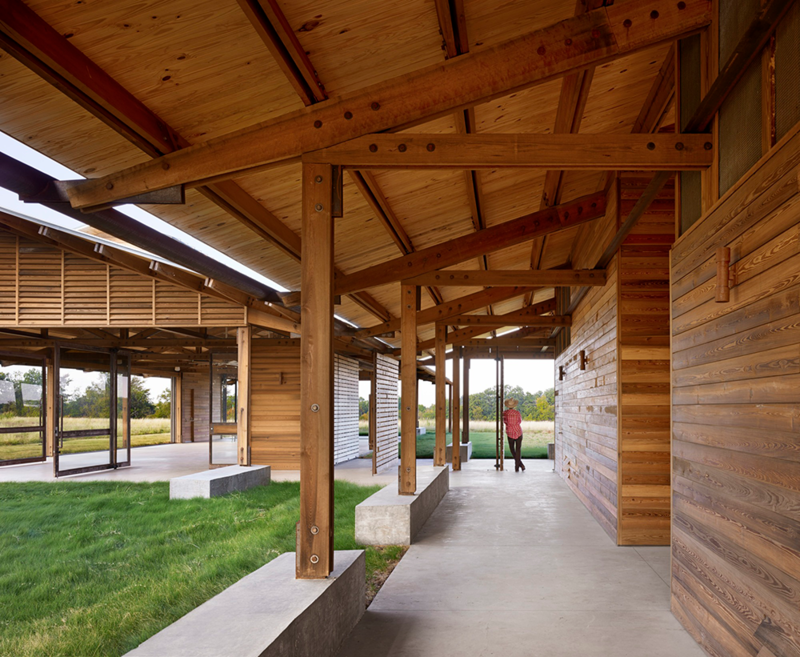 The Pavillion’s form is derived from a tree; sheltering against the hot sun, protecting against harsh winds, using the sun’s warmth, and opening up to allow cooling breezes to flow through the space on warm days, connecting one’s senses to the prairie. The building collects rainwater and processes wastewater through constructed wetlands, returning clean water to the aquifer, while delivering 150% of used energy through photovoltaics. Like the prairie horizon on which it sits, its design hugs the earth, and its biophilic beauty lifts the soul. The Jury found the Spheres to be a vibrant, lush, and sensory-rich workplace steeped in biophilia, especially daylight, water, vegetation, sensory variability, prospect, and refuge. The interior affords the experience of a botanical garden, but with a controlled indoor climate conducive to work. The habitat provides spaces to work alone or with others immersed in a rich variety of natural features, including a three-story green wall, a large central tree, a lush understory, and the sounds of running water. The spatial design provides an array of prospect and refuge experience, from views across the entire interior to numerous refuge spaces tucked under or into the vegetation, including a well-used “nest.” The central winding staircase gradually opens the visual field to new views as people progress from the more shaded space of the ground floor to the dappled light of the canopy and eventually the bright vistas of the upper story. The overall experience is intended by design to be softly stimulating and conducive to reflection as well as socially energizing. It does this by creating a variety of habitat “patches” that support different kinds of behaviors, both solitary and gregarious. Where many biophilic design projects connect to outdoor green space, the Spheres create a unique indoor green habitat. A central point of discussion with the jury was, “Does biophilic design need direct engagement with outdoor nature, or can it be its own human-created indoor environment that builds on the basic elements of biophilic design: prospect and refuge, plants, sensory change, daylight, and variation in patterns, colors and textures?” The conversation continues and The Spheres represents a unique and important example of Biophilic Design. The Environmental Learning Center is home to an extraordinary Tacoma public high school, the Science and Math Institute (SAMi). Its location within Port Defiance Park–with access to the forest, the beach, and the Aquarium–reinforces biophilic connections for the students from the outset. The whole and all its parts create a high school learning experience that any student elsewhere would envy, and that all schools would be smart to emulate. The Jury found 1212 Bordeaux to be an elegant, yet restrained, application of Steve Kellert’s biophilic design principles for human well-being and environmental sustainability. The daylight design is especially innovative, with controlled daylight coming from all directions, creating the sense of being outdoors but in a protected space. The daylight provides sensory change throughout the day as it changes in color, intensity, and direction as if it were a living entity. The sensory change is also apparent on the building façade as the change in daylight over the day creates variation in the color of the façade. The natural wood and neutral color scheme create a sense of calmness that is livened by the people who inhabit the building. As one employee said in a post-occupancy evaluation of the building, “the space reflects caring and attention to the Googlers personally.” A building could ask for no more than to care for and nurture its inhabitants in a sustainable, biophilic environment, and the project highlights a way forward for considered biophilic design. The International Living Future Institute is an environmental NGO committed to catalyzing the transformation toward communities that are socially just, culturally rich and ecologically restorative. ILFI is premised on the belief that providing a compelling vision for the future is a fundamental requirement for reconciling humanity’s relationship with the natural world. ILFI operates the Living Building Challenge, the built environment’s most ambitious performance standard. It is a hub for many other visionary programs that support the transformation toward a living future. Learn more at http://www.living-future.org.